Given what we know about the laws that govern the universe, it seems highly unlikely (highly, highly unlikely) that we will ever travel all the way from Earth to the far side of our galaxy. Take a moment to let that sink in: We very well might never make it out of our own little galaxy. It’s even more unlikely that we will ever traverse space between galaxies…never feel the warmth of a star from an exoplanet in the Triangulum Galaxy. Even “small” distances (like the distance that separates Earth from Pluto) are unimaginably vast, spanning billions and billions of miles. And if that’s not enough, it continues to grow larger by the day. 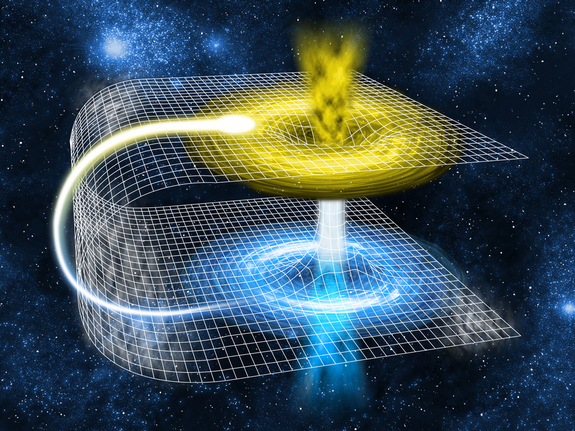 The first type of wormholes — called intra-universe wormholes — in the simplest possible terms, can be likened to anchors that tie our universe with others found within the multiverse (to put it plainly, they are portals into other universes). Such wormholes would be impregnable for normal matter and impossible to maintain without some exotic kind of matter holding the “mouth’ open. 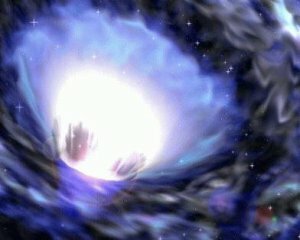 As an interesting side-note, various theoretical physicists suggest that the supermassive black holes found within the central region of most large galaxies might actually be wormholes instead. They have even proposed a way of testing this hypothesis. The second type is the one most people are familiar with: places where spacetime folds in on itself, formulating ‘bridges” that not only connect two distant points in space, but they create shortcuts between them. You would enter the wormhole from one location and you might find yourself on the other side of the universe when you come out. It must be said that if these structures do exist — which is possible given the fact that one type of wormhole within a black holes is supported by Einstein’s theory of general relativity (at least some part of the mathematical framework is) — they still might not be traversable. Even if some types are, you would still need to overcome some pretty difficult obstacles to make it to the other side without getting shredded into a trillion tiny pieces, or becoming incinerated by the heat. Despite never having seen a wormhole, or finding definitive proof of their existence, the whole thing raises an interesting question, what would it be like to travel through a traversable wormhole and live to tell the tale? What would you see? Of course, we can’t answer that question with any certainty, but this incredible video explores the possibilities. Once you journey through the first horizon (the outer-most one), you soon meet the second boundary, the inner-horizon. Hamilton posits that this trip might take around 20 seconds, assuming the black hole is around the same size as the supermassive black hole looming in the central region of the Milky Way, called Sagittarius A*. Hamilton continues, “The trip down to outer horizon of the Reissner-Nordström black hole is similar to that of a Schwarzschild black hole.” Once you completely pass through the outermost boundary, your view would essentially split in two in both scenarios. Only you wouldn’t even know that you’ve completed the journey without the grid represented in the animated GIF on the right. This view changes as you enter the inner horizon. The farther you fall in, the more the inward flow of spacetime moves along, “slowed by the gravitational repulsion produced by the negative pressure of the radial electric field.’ Once you reach a certain radius, the flow of spacetime speeds back down to light speed, where you are met with all of the light and information you missed up until that point. It is now able to propagate upwards to your line of sight. To put it another way, “if you look at your feet, you do see them below you, but in fact the feet that you see emitted their light at a time when they were outside the current position of your eyes. At the inner horizon, you are hit by an infinitely bright, infinitely energetic burst of light. The bright point of light is an image of the outside universe reflected by the gravitationally repulsive singularity. The burst of light contains, infinitely speeded up, the entire history of the universe. The grids are used to help visualize the internal makeup of the singularity, but to expand:. The horizon grids are colored with the blackbody color that you would see if the objects emitting at the horizon had a temperature of 4096 K and were free-falling radially from zero velocity at infinity. As you fall inward through the inner horizon, a new grid appears, marking the ingoing inner horizon. The dark red grid marking the antihorizon becomes temporarily invisible as you turn around inside the wormhole, but then reappears as you approach the inner horizon going outwards. As you pass back outward through the inner horizon, a third grid appears, the outgoing inner horizon, or inner anti-horizon. As its Penrose diagram shows, the (outgoing) inner anti-horizon is not the same as the (in-going) inner horizon. As the white hole catapults you outward into a new universe, a fourth grid appears, marking the white hole’s outer horizon. Inside the inner horizon, the flow of space slows down, turns around, and accelerates you back out again, back towards the radius of inner horizon. This region inside the inner horizon is the wormhole. What If I Could Survive? It has been speculated that if a black hole is sufficiently large enough (say, with the diameter of our solar system), you might actually be able to survive the spaghettification process long enough to witness something truly spectacular. In short; the larger the black hole, the less extreme its surface is. Therefore, if a black hole were large enough, it would theoretically be possible to maintain your structural integrity. Given the basic tenets of general and special relativity — that the faster objects move through space, the slower they move through time — we can deduce that every object (including you) that was ever swallowed by the black hole would feel the effects of the time dilation brought on by the curvature of space/time. The objects that hurdled into the black hole before you did would experience a larger time dilation than you..
Conversely, the objects that will enter it after you will experience less time dilation. Thus, if you’re able to look forward toward the black hole as you’re falling into it at relativistic speeds, you would see every object that has fallen into it in the past. 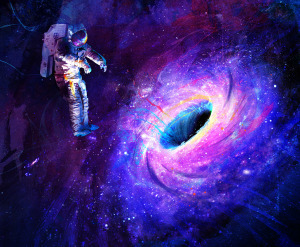 If you look backward, you’d be able to see everything that will ever fall into the black hole after you. You’d be able to see the entire history of that particular spot in the cosmos from the inception of the universe, until the end of time (at least until Hawking radiation causes the black hole to evaporate). What Happens When You Put Slime Mold in a Maze?